I am updating this to say I cannot tell you how sad I was to see these photos on Pinterest - despite asking and polite requests - I now submit copyright forms to Pinterest at every opportunity. There are many lovely photos out there people love seeing on Pinterest so please use those not mine. Rainy again today - felt a little penned in so tra la la'd down the local high street - stopped off to see the ladies manning their little stall - they were very welcoming and they commented they had not seen me for a while as they had been saving embroidered tablecloths for me....they will bring them in for me next week....I do not need any more tablecloths....They did have a little pile of hand painted bone china plates (six in total - I donated the saucers back)......I do not need any more saucers (or plates)...together with some pretty hankies (all with hand crocheted edges) and one or two scarves.... I spent £2.99. So already the day seemed brighter. We were chatting outside the local church which was having their summer fete - we had chatted so long the fete was on the point of closure....tables were cleared and just a few cakes left....I could have them for a pound (5 in total) and three boxes of candles (one of such great delight it warrants a separate post) from the 70s....very handy for Christmas (always best to buy out of season I find!). 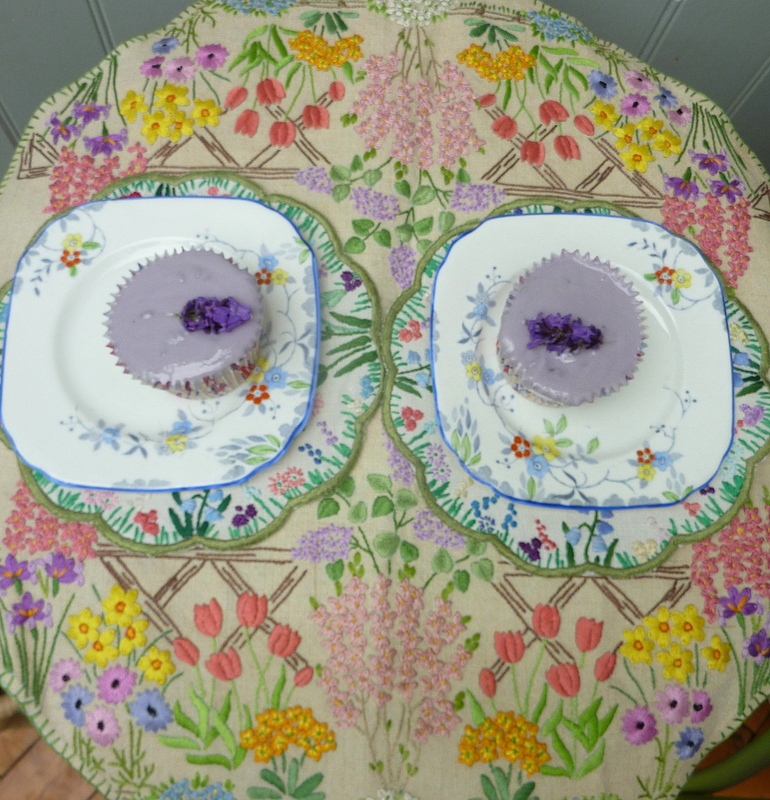 So here we have some pretty plates topped with the most FANTASTIC little cakes I have EVER EATEN (words cannot convey how ruddy marvellous they were) - all finished with a sprig of fresh lavender and just quite simply deliciouso. I may have come home and busied about finding the nicest embroideries to display such delights. All topped off with the fact that I will have finished writing my essay by tomorrow - tra la la la la! I hope that you too had some cake purchases/makes. PPS My neighbour who kindly gave me the carrier bag of buttons - you remember - knocked on our door the other day with WARM...FRESHLY MADE roti bread - just because - hot out of the press and again deliciouso - she apologised that she had not made the matching vegetarian curry but promised that she would next time....I very nearly slammed the door in her face and shouted : 'Don't come round here again until you have EVERYTHING ready'...ho ho, just joshing! PPS Another neighbour knocked on my door and said that I could pick all of his red currants this year as he was not so fond....I will make a summer pudding with them I think. PPPS In return I proffer nursing advice and first aid wisdom, advice on whether child x should go to hospital (head injury) and neighbour y really should have the leg ulcer seen to...oh all right I will have a look at it myself...sometimes sadder advice... that sort of thing....fair exchange I think!! Many thanks Julie - too many cakes in our house I fear! That is a gorgeous tablecloth!!! and plates etc. Yes, one wouldn't cut up an embroidered tablecloth unless it was damaged in some way, they are such treasures.I love dreaming about who made them and when, same as with all old things, so much lovelier than new. 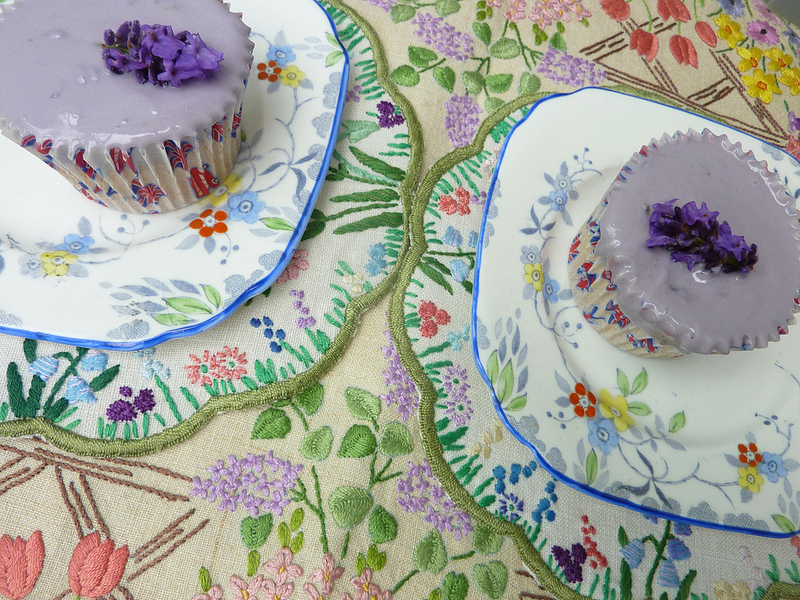 Your tablecloth is beautiful and the cakes look delicious too. Don't know if it might help but I have just been on Pinterest and found there is a way to stop people pinning pictures from your blog or website. if you go the 'Help' page on Pinterest then to 'Getting Started' then to 'Linking To Your Blog Or Website' you get a code you can use on your blog . If someone tries to pin a picture they get a message come up saying 'pinning from this site is not permitted'. if you can't find the code I can email it to you. Many thanks Cass - hope to see you soon! Have you ever read, Hat full of sky By terry Pratchett? basically it is a book about simple things, and that by helping people out you get things back in the strangest of ways and mostly that one good deed leeds to another....i have read it a hundred times! Where we live it is a strange place lots of new housing has gone up, and some people just arn't so friendly, they shut their doors and close their curtains and look at you as if you have 3 heads! sad really, in our road though it is lovely, i like to knock on the neighbours and give them eggs and things from the allotment, the other day I locked myself out and knocked on my neioghbour had tea and a nice chat.... oh well you have to make the effort I guess. you have made me want to bake a cake!!! I miss living in a community where everyone knows you and cares about you. These days many people just seem to shut their doors oblivious to those around them. Very sad. And yet people also say they would like to be part of a community. Do they not understand that for a community to exist and grow everyone has to actively play their part. Moan over, I love the tablecloth, plates and cakes. 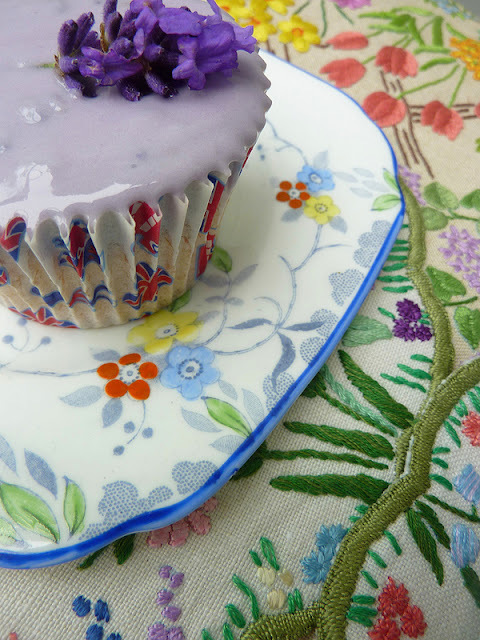 Can you ever have enough tablecloths or pretty china? 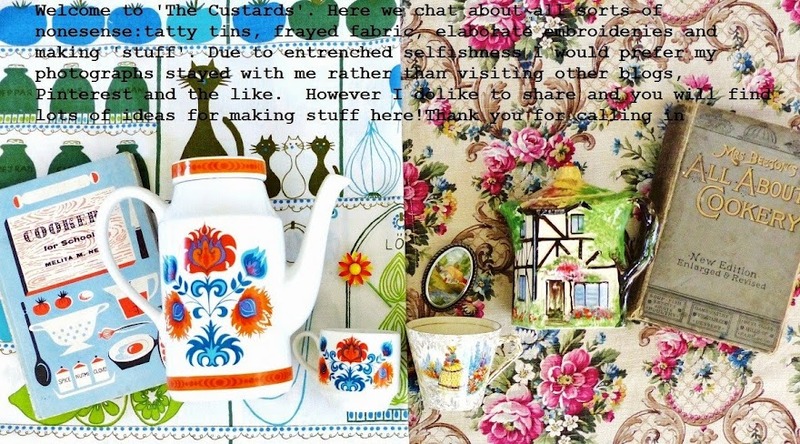 Thank you Phillippa - there is always space to s-q-u-e-e-z-e- one more tablecloth/plate in...oh dear. Community can sometimes be a little one-sided sadly..
Hi Jenny just returned from my hols[lots of lovely sun!!!] so have had GREAT pleasure in catching up with your blog and loving everything as always.Only thing is I was trying to give up cake as people keep asking me if I'm pregnant!! !The cheek of some people!! anyway just ate half a dozen custards creams instead! !Well I may as well eat for 2!!!! Pinners are not bad people. They are just people who think the things in your blog are beautiful. You could think of it as a huge compliment that they want to pin your photos. They are your biggest fans. People who are inspired by what you share. :-) And most pinners would never dream of pinning if they KNEW you didn't allow it. But, I can imagine that it must be very frustrating for you. Here are a few suggestions that might help pinners be more aware of your wishes. You can add a note to your sidebar asking for no one to pin. I have a statement on mine asking people to link back to my blog if they pin, and not to pin any photos of my family. In addition, I have added a reminder note under every family photos that simply says 'this photo may not be pinned". The combination of those two things has worked very well for me so far. You can add something to your blog that keeps your photos from being pinned. Basically if anyone tries to pin a photo, they will get a pop up message that says something like "pins are not allowed on this site". Another thing you might consider doing is adding a c. copyright mark in your watermark on each photo. Or the addition of the words "No pinning allowed" right along side your blog name in your watermark . Once again, I am very sorry. And best of luck getting it all sorted out. I did not know that I had to be the one that made sure that there was something that told everyone about not pinning - if I were pinning something I would have asked first. On most posts I ask people not to pin the photos = this one for example and it made no difference. My friend Mary put her name on her photos and had it carefully deleted out by someone who then reposted it. In this format there is no side bar or way to add a no pin thing - again though I am left wondering why do I feel as though it is my fault and that I should have said. I am quite sure that people who pin photos are not bad people though I have had several comments that have left me reeling a little! I have been quite happy sharing photos with a kindly band right here. For me it makes my blog all a bit redundant as I might as well just post my photo straight onto there - the impression I am left with is that people take the photos without reading the words. Jenny, I think maybe the answer for you might be to have a private blog. You would be able to choose the people who could see your photos... just people you trust. . That would pretty much eliminate any pinning in the future. And you can work with Pinterest to take down the ones that are currently out there. So sorry you have had nasty comments. I hope you didn't take mine that way. It certainly wasn't intended as such. I'm very sorry this whole thing has caused you such distress.